Leicester City, Newcastle United and Sheffield Wednesday were three of the clubs who had scouts at the Europa League match between Benfica and Eintracht Frankfurt on Thursday night. 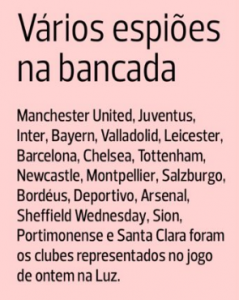 It’s Portuguese newspaper A Bola who reports the English sides’ visit to the Estádio da Luz, although they don’t say who the target of each club was. What the scouts saw was Benfica winning Eintracht 4-2, and getting a good advantage to now decide the quarter-final in Germany. We haven’t really seen Leicester City or Sheffield Wednesday being linked to Benfica or Eintracht Frankfurt players in the past few months. Newcastle, on the other hand, were linked to one Benfica player. That’s Andreas Samaris. News from Portugal said he rejected a Magpies’ offer back in January, and as he still didn’t sign a renewal with the Eagles, he’s set to become a free agent in the summer. Samaris had a good game last night, being the most important man in defensive midfield, recovering balls and making good pass to attackers. João Félix, who scored a hat-trick, was obviously the man of the match. Ruben Dias and Gedson Fernandes had pretty good performances as well. The two Eintracht players who scored against Benfica had a special taste for doing so. One of them was Jovic, who’s loaned by the Portuguese side and shouldn’t be back to Lisbon at the end of the season. The second one was scored by former Porto striker Gonçalo Paciência. Now although Leicester City and Newcastle United often have scouts at the Estádio da Luz, it’s quite curious to see who Sheffield Wednesday were keeping an eye on.